The students need two points from their remaining two games to reach the post season but face league champions Highfield at the Dub on Saturday and team manager Chris Moore is expecting a free-flowing game. “We are one of the few teams that beats Highfield down there and then they come up to us and always get points out of us,” he said. 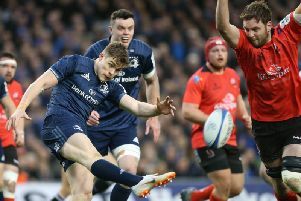 “We have had some good battles with Highfield and they are not your typical Munster side, they like to play a bit of rugby. Moore continued: “It’s the first time in a long time that we have put ourselves in this position. Normally at this time of the year we’re mid-table and we’re just clicking the fixtures off, but to be fair to the boys six bonus point wins out of seven since Christmas - they really have worked hard and we are getting the rewards. “But it is not done yet we still have to play Highfield who are top of the league and we need to secure two points out of the last two games. “They are a formidable side and have won the league by righ. They have been the top side. Then we have to go away to Old Crescent, nothing is easy but we have put ourselves in a good position. Queen’s have no major injuries going into the game.